A relative of mine living in another country sent me an email last week. He has two children aged 5 and 8. He was going to Sri Lanka for a short trip and he asked me what could be good Sinhala books for his children. His email had quite descriptive requirements as to what he needs. "Everyone these days write childrens books to find money. Most of the childrens books today are not suitable for children. Not only the content, but the language too is disastrous. Can you please recommend some books which you have allready read and no nonsense? So that I could read those to my kids" is part of the email ! It took a long time to come up with a reasonable reply where I dragged the old books out of the shelf and spent more time with memories. Therefore I thought may be I will share it as it could be useful to many others as well. I'm writing this with all love and much respect to my father and his library. These books made my childhood, and I hope those will lighten up many other children's' lives as well. 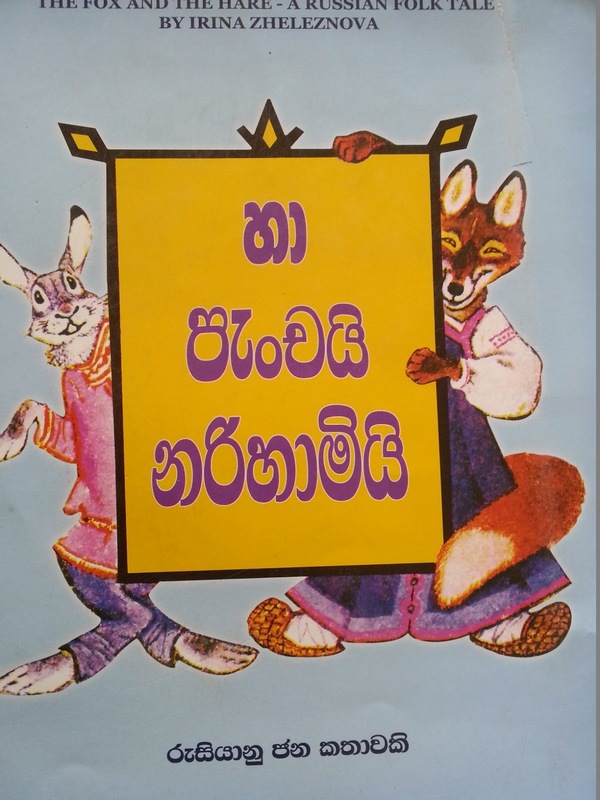 These include Sri Lankan books as well as translated books. I don't know whether some of these are available now. Therefore I tried to add the publisher and the printed year. So that some one who need can find the book. They are not in any particular order. 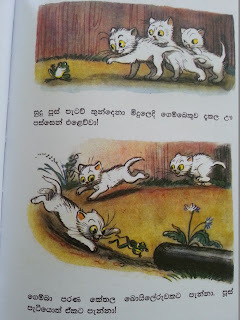 These are not the best ever Sinhala books either. I will add more books in to this list, when I find rest of the good books. Send me if anyone have suggestions as well. This is one of the books still put a happy smile on my face when I see it. Gives a real insight in to the folk stories of the country in simple language a child can enjoy. 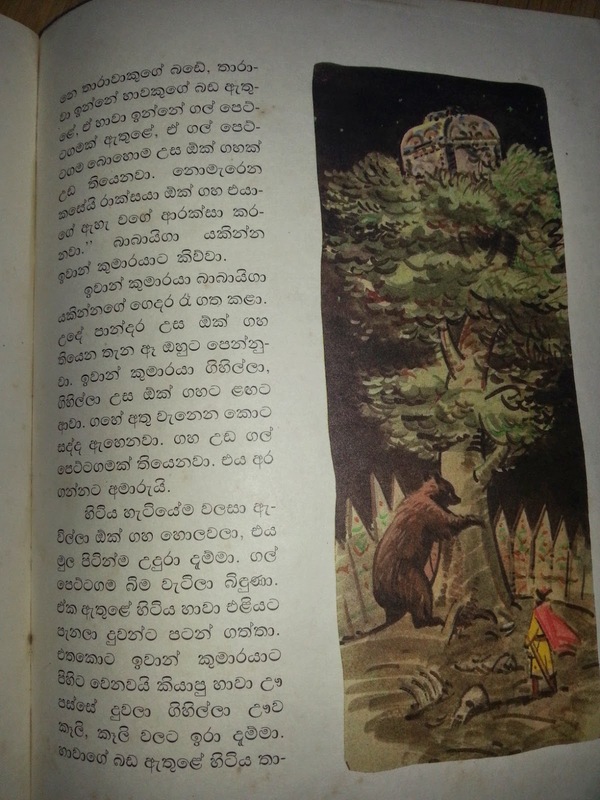 The wide range of stories include stories about "gamarala"s , poor men, rich men, dumb men, princes, princesses, kings, daemons, hens and many more characters. When there are stories with kings, you should know that it has certain amount of violence too. But I would rate it as folk intelligence or history, than violence. Beautiful stories to read if you bring up your child closer to realities of the world. This is the present my father gave me for my 8 years b'day. I loved every story in this book. Even after I became a grown up women, some of these stories ring the bell in my head. Fairy tales mixed with folk tales from the Soviet Russian times which tells how hard working and good , one has to be to reach their targets. Just like in every fairy tale, good person always wins and bad person looses. I believed in babayaga witch, princess Marya, Prince Ivan, wicked step mothers and how everything goes fine at the end of every single damn story ! 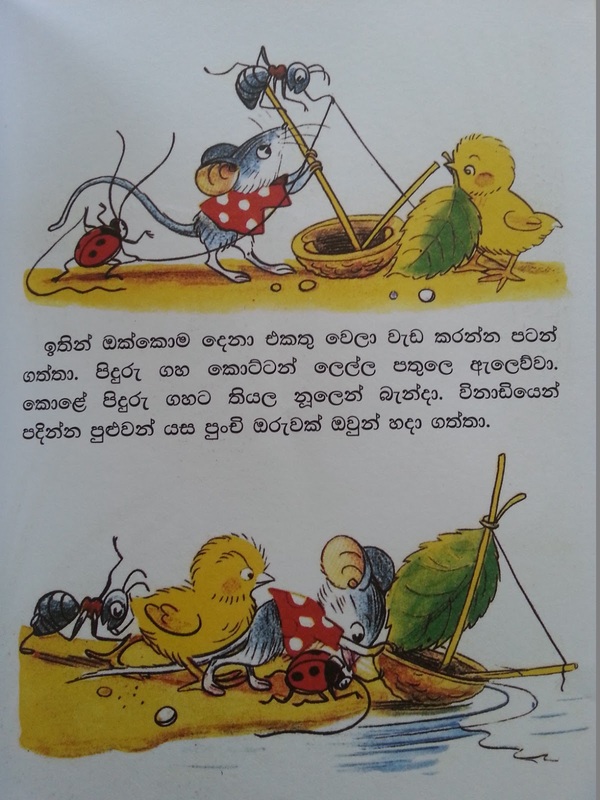 This is the story behind the famous Sinhala saying as of the topic. 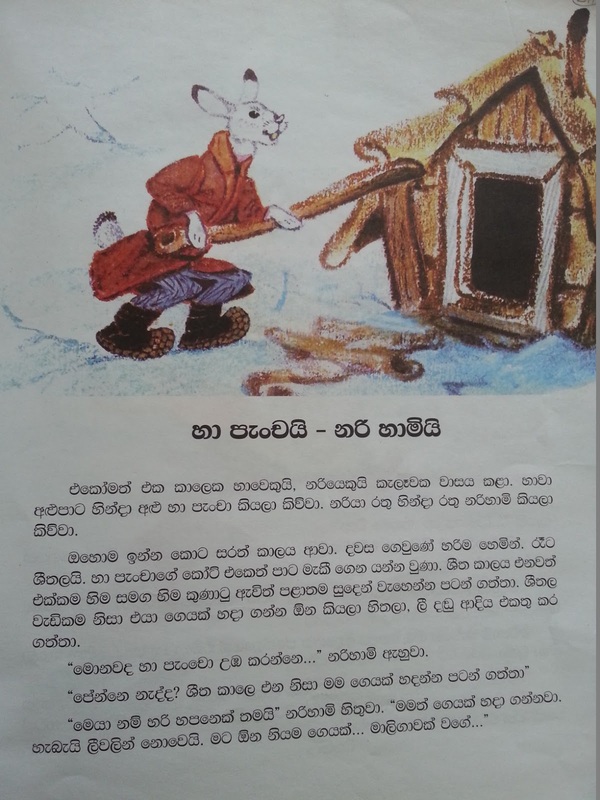 A typical folk book went on to describe how a "gamarala" kept a promise even to a fox, but then again use his intelligence to save his daughter. Children find this story quite amused. On a different note, almost all the children's books in this series written by prof Dissanayaka is very good. Some of the other stories are as below. Sirimath is a beautiful Sinhala poem book about a child call Sirimath. It describes characteristics of the said child which is traditionally believed to be a perfect child. He wakes up in the morning, worship, clean house, study, eat on time, happy to go to school, good at studies as well as sports, respect adults and he is a treasure for the family. Apart from the good advices, it gives good idea about rhymes as well. Even my 2 year old boy loves this. Adventurous story which carries the beauty of the language. The pattern of the words is such that it can be read even to a very small child. Perfect for a drama and most of the page is dedicated to the awesome drawings by author her self. It is a story written in 1952. 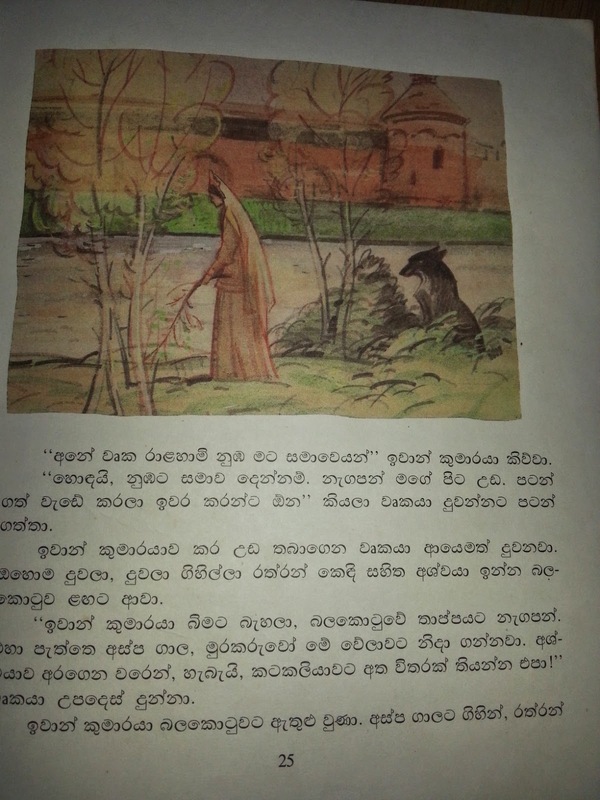 Story is about an elderly village man coming to Colombo and discovers umbrellas for the 1st time and his endless battle of bringing an umbrella to village and secure it too. After 60 odd years, now almost all children have seen umbrellas at home, still they find the story natural and entertaining. Internationally renowned book, which is translated in to number of languages. I have no idea whether a new print of this book is available. But I had to put this in to list as I prefer it. Back in 60s there was a children's book series by Saman Publishers and this is the 10th book of this kind. Book specifies that it is reading material for 4th and 5th grade students. The writing style here is more similar to the stories from ancient Indian Ira and written in the same flow of "jaathaka katha". The story depicts the journey of prince named "Wansapaala" to find the golden bird who eat the golden fruits in the royal garden. The usual adventures went on about prince meeting a horse and a princess and a fox and how he finally became the king. Beautiful fairy tale. Every child has a book which provoked their love towards space science. This is mine. A book originally written in Russian, by Yepram Lewithan. This book is a great introduction to sky, sun, stars, space and how to observe those and research on those. There is an introductory page in the start of the book. That is for the parents, as to how to read the book with the children. Story goes on as a story which a father tells his children. Its a mix of science and fairy tale in order to keep the interest while achieving learning outcomes. There are very easy , basic, yet interesting scientific observations to do while reading the book. For example it explains how the light travels, using a mirror. It has stories starting from a why ancient people got scared to sun, to the modern astronomy whether we can live in stars. Book is full of pictures. Full of logic. Full of chances to think and come up with own stories too. Perfect for a child in the age 8 - 12 years. This book contains some poems and songs written by the great poet Kumarathunga Munidasa. Its prepared with questions for primary grades. Book is produced by a retired principle named T. B Arangalla. If you can get the child to listen to these songs along with the book, they will grasp those soon. 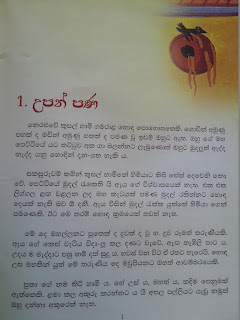 Need not elaborate on poet's capabilities on rhyming Sinhala words together with the greatest meaning. Just beautiful. One of my favourite childhood adventure series. There are nearly 30 books of this series. All stories roam around the boy names "wada bari" and his friends. A boy who was not good at anything, keep trying everything and then finally he makes it to the win. Another set of beautiful series from Soviet children's literature. These books contain knowledge, fun as well as a feeling of humanity auto inserted in to its little readers. Translation - Padma Harsha KuranagePrint - Pragathi prakshana (progressive publishers) , 91, N M Perera Mw. This is a book suitable for toddlers and pre schoolers too. Both the writer and the artist in the book is V. Sutheyew. It gives clear visuals on the story in the book. It has 13 short and beautiful stories for children. Most stories are about animal world, but every story contains some smart enough advice behind it. For example, few stories went on to say , how some characters laugh at others and how in the end those with courage and right doing wins the life. 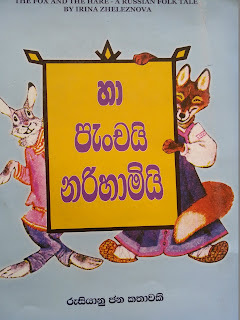 Name of the book - haa panchay nari haamiy Translation - Sarath KodagodaPrint - Kurulu publishers, 594/1, Nawala Rd, Rajagiriya. This story is a Russian folk tale re written by Ayrina Selesnowa. Beautiful story which went on to explain a story about a fox who lives in Hare's house by force and hare's battle to get it back. Cunning fox threatens to bigger animals such as wolf, cow etc and they get scared not knowing their capacity. Finally the fox is thrown away by a brave hen who can scream louder. 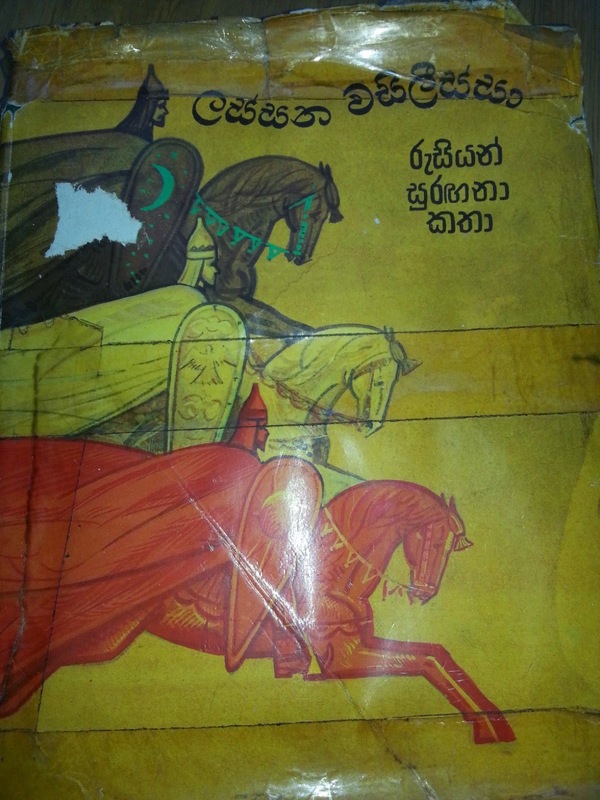 Name of the book - hath panaAuthor - Kumarathunga MunidasaPrint - M D Gunasena (Pvt) Ltd, 217, Olcott Mw, Colombo 11. 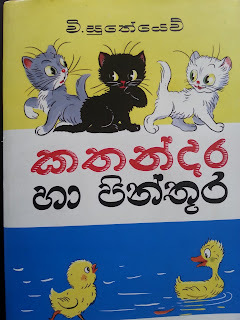 An ever famous book by the great author, read by many Sinhaleese children for almost 5 decades, has been re printed with beautiful page setting and in good quality paper. A Fun story about this boy call "kiri haami" who happed to have seven chances of dying. Contains the matching arts of Sibil Weththasingha. When foolish Kirihaami goes to have a bath from the well, a monk who crossed the road predicted what would have happened to him if he bath that way. Kirihaami asks the monk when he dies and the monk replies he will die on the day where his toes and head gets equally cold. So the story went on as how Kirihaami thinks he is dead in certain instances. This is a very fun reading book for school children. But if you are reading it to young children, its better to teach them that some of the jokes in the book should not be tried in real life by any way. You know, just to be safe. Thank you! This list is perfect for my kids too. Agree with all books, except Sirimath. ඕක සින්දුව ගත්තේ දෙවියන්ගේ බාරේ සින්දුවෙන් නේද??????? 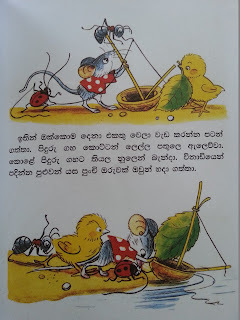 Can someone remember a sinhala story book written about a Konda kurullek??? I cant recall the name. If someone remembers it please lemme know. And from where can buy Lassana vasalissa book??? Thanks in adavnce!! !